Kimi Raikkonen is a throwback racer of the highest order. He tells it like it is. He doesn’t seem to spend a lot of time worrying about working out. He plays badminton with Sebastian Vettel. He has a great sense of humor. He likes drinking… a lot. But he’s also a kind fellow, as Ferrari driver Felipe Massa showed on Instagram this morning. Professional racing drivers frequently trade helmets with each other. It’s a way to build camaraderie as well as a way to make a pretty bitchin’ collection of helmets. 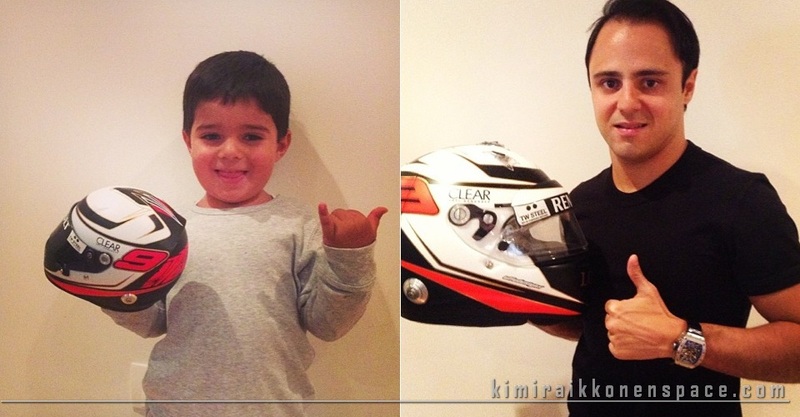 Raikkonen and Massa agreed to trade helmets and Kimi just dropped his off with Felipe. But he also came with a surprise for Felipe’s son: A miniature replica of his helmet. That’s just straight up cool. You are the man we´re beliving, go Kimi, very best wishes to You!! I`m sure, everything will be…………. OK…………..! Onnea Kimi! Good luck Kimi! kimi is the best! and felippe isn’t bad at all if he gets compatitive car and fair threat of alonso!! go guys! What a nice gift from Kimi!